It is no mystery that working out is vital to a healthy, happy body and mind. However, when it comes to physical activity, it’s possible to have too much of a good thing. Recent data shows not only do you not have to spend countless hours at the gym to benefit from exercise, but also that may be counterproductive to your hormones. If you have ever trained for a marathon or triathlon, you know that the traditional training schedule requires an amount of time that rivals that of a part-time job. Additionally, chronic and excessive long-duration training (over an hour) can actually have a negative impact on your health and hormones. I call long-duration cardio training by a specific name: chronic cardio. 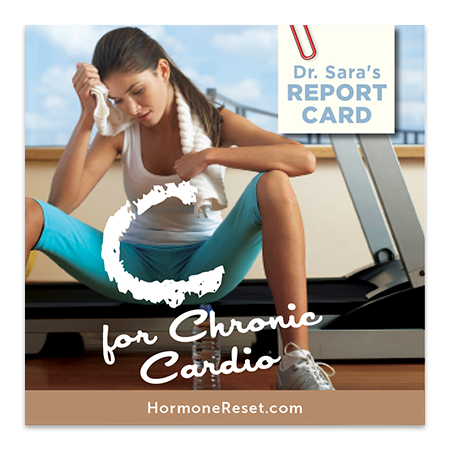 Even if you aren’t training for a specific event or sport, racking up countless hours on the road or treadmill will likely trigger an undesired hormonal response, which is not helpful if you are already trying to manage chronic stress or adrenal fatigue. You are also at risk for overtraining and injury. In previous posts, I addressed how an imbalance of the stress hormone cortisol can lead to fatigue, moodiness, muffin tops, and poor memory. It is important to remember that cortisol increases in response to an elevation in stress, both emotional and physical. The longer your workout, even at a moderate intensity, the more cortisol your body is releasing. The cardinal rule of hormone balance is to banish stress, not add more to your plate. When applied to your exercise regime, the idea is to be adaptive and resilient, and not to feel like your exercise is another source of stress. Beyond the emotional and mental havoc a cortisol imbalance can cause, constantly elevated cortisol can lead to muscle break down, suppression of the immune system, bone loss, and stubborn belly fat. [1, 2] Studies of marathon and half-marathon runners measuring salivary cortisol levels show a dramatic increase in cortisol not only during the race but for hours to days after they had finished. Have you ever been in an argument and spent an hour fuming over the interaction? 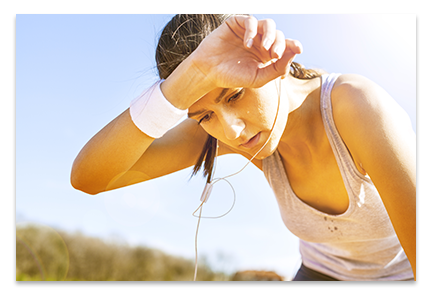 That’s what’s happening in your body after you have completed a long, exhaustive workout. Instead of shaking it off or imagining witty comebacks, your body is dealing with the physical stress by breaking down muscle, connective tissue, and interfering with bone development—essentially undoing everything you were trying to accomplish by working out in the first place! The good news is that you can still get your sweat on, build muscle, or just work out some stress without all of the negative side effects of long-duration exercise. The emerging trend of high intensity interval training (HIIT) incorporates intervals of fast-paced movement with rest periods or lower intensity activity. Tabata squats: Do as many squats as you can for 20 seconds, that number of squats is your score. Rest for 10 seconds. Repeat for 8 rounds. Your final score is the lowest number of squats you completed in any round. So if in round 1 you completed 17 squats, but in round 2 you only did 10 squats, 10 is your new score. This can be done with push-ups, sit-ups, you name it! If you squat, be sure to use good form as women seem to be at greater risk of hemorrhoids from squatting, especially if you’ve had full-term pregnancies. Sprint intervals: Run 400m hard! Then rest and repeat for at least 4 rounds, keeping track of your time each effort. You can rest as needed; until you feel ready to hit the run hard again. Or you can shorten the rest to a specific amount of time. The distance can vary, 100m, 200, etc. Just keep it short enough to keep intensity high, so nothing over 800m. Weightlifting: There is a difference between lifting weights or sitting on a weight machine, and the sport of weightlifting. Weightlifting as a sport includes several different moves including the deadlift (it sounds kind of scary, but think picking up something off of the floor), presses (lifting things over head), and weighted squats. Check out a gym in your area for guidance on proper lifting technique. HIIT and Tabata are better choices when your hormones are out of whack, and you want to get them back on track. They improve stress resilience, and help you boost lean body mass, and by extension, your metabolism. They improve insulin sensitivity. They raise testosterone and growth hormone. They are far better than chronic cardio for the enlightened female body. I Stelzer, et al, “Ultra-endurance exercise induces stress and inflammation and affects circulating hematopoietic progenitor cell function,” Scandinavian Journal of Medicine & Science in Sports (2014), 10.1111/sms.12347, accessed February 15, 2015. MA Lobouesse, et al, “Associations among endocrine, inflammatory, and bone markers, body composition and weight loss induced bone loss,” Bone, 64 (2014): 138-146, 10.1016/j.bone.2014.03.047, accessed February 16, 2015. MF Piacentini, et al. “Stress related changes during a half marathon in master endurance athletes.,” The Journal of Sports Medicine and Physical Fitness (2014), http://www.ncbi.nlm.nih.gov/pubmed/25303064, accessed February 16, 2015; K Karkoulias, et al. “Hormonal responses to marathon running in non-elite athletes,” European Journal of Internal Medicine, 19, no. 8 (2008): 598-601, 10.1016/j.ejim.2007.06.032, accessed February 16, 2015; BR Kupchak, et al. “The impact of an ultramarathon on hormonal and biochemical parameters in men,” Wilderness & Environmental Medicine 25, no. 3 (2014), 278-88, accessed May 12, 2015. T Bobbert, et al. “Leptin and endocrine parameters in marathon runners.” International Journal of Sports Medicine 33, no 3 (2012): 244-8, accessed May 12, 2015. EM Peters, et al. “Vitamin C supplementation attenuates the increases in circulating cortisol, adrenaline and anti-inflammatory polypeptides following ultramarathon running.” International Journal of Sports Medicine 22, no. 7 (2001): 537-43, accessed May 12, 2015. MI Kingsley, et al. “Effects of phosphatidylserine on oxidative stress following intermittent running.” Medicine & Science in Sports & Exercise 37, no. 8 (2005): 1300-6, accessed May 12, 2015. T Emberts, et al. “Exercise Intensity and Energy Expenditure of a Tabata Workout.” Journal of Sports Science & Medicine 12, no. 3 (2013): 612-13. Accessed February 15, 2015. http://www.ncbi.nlm.nih.gov/pmc/articles/PMC3772611/. M Gibala, et al. “Short-term sprint interval versus traditional endurance training: similar initial adaptations in human skeletal muscle and exercise performance,” Journal of Physiology 575, no. 3 (2006): 901-911, 10.1113/jphysiol.2006.112094, accessed February 15, 2015. JP Little, et al. “Effects of high-intensity interval exercise versus continuous moderate-intensity exercise on postprandial glycemic control assessed by continuous glucose monitoring in obese adults,” Applied Physiology, Nutrition and Metabolism 39, no. 7 (2014): 835-841, 10.1139/apnm-2013-0512, accessed February 16, 2015. CG Perry, et al. “High-intensity aerobic interval training increases fat and carbohydrate metabolic capacities in human skeletal muscle,” Applied Physiology, Nutrition and Metabolism 33, no. 6 (2008): 1112-23, 10.1139/H08-097, accessed February 16, 2015. JL Talanian, SD Galloway, GJ Heigenhauser, A Bonen, and LL Spriet, “Two weeks of high-intensity aerobic interval training increases the capacity for fat oxidation during exercise in women,” Journal of Applied Physiology, 102, no. 4 (2007): 1439-47, http://jap.physiology.org/content/102/4/1439, accessed February 16, 2015.